Chicago-based Pizano's Pizza & Pasta is about as Italian as you can get. Future home of Pizano’s Pizza & Pasta. Photo by Jennifer Rick. Four years in the making, a Chicago-based pizza chain is finally expected to make its Milwaukee debut next month. 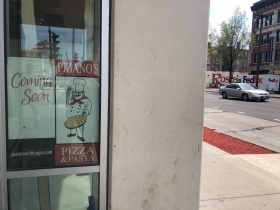 The goal is to have Pizano’s Pizza & Pasta up and running at 1150 N. Water St. in time for Summerfest, according to the facility’s general contractor. 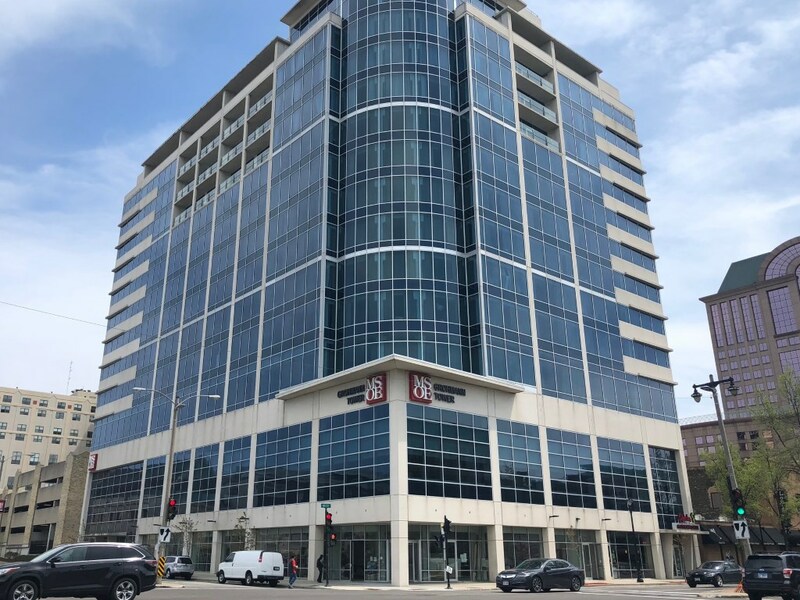 The restaurant will occupy the corner space of MSOE’s Grohmann Tower, which is also home to Qdoba and student apartments. Owner Rudy Malnati Jr. announced the first Milwaukee (and Wisconsin) location of his restaurant chain in 2014 and had plans to open in spring of 2015. 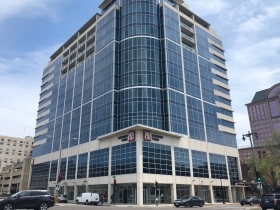 Malnati told the Journal Sentinel in 2016 that the opening date was pushed back due to construction delays and would be open that June, but that never happened either. Slow progress continued to be made on the building’s renovations, with work picking up more in the past year. Some of the factors causing the delay remain unclear, but the general contractor says that part of the reason renovations have taken so long is because of the facility’s size. 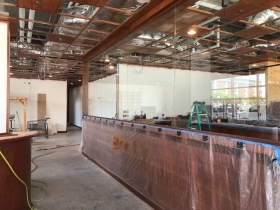 The entrance of the restaurant opens up into the main dining room, which is separated from the bar by a partial glass wall. The goal of the partition is to reduce noise in the bar area, which is furnished with custom woodwork and custom paint. Both areas will have TV’s as well. 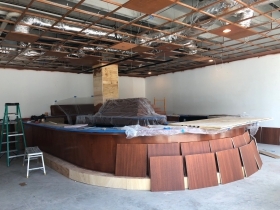 In addition, a smaller dining area and bar will be available for private parties and events. 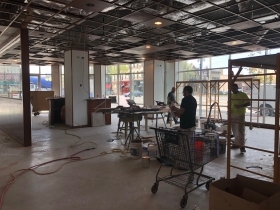 A separate carryout area is located towards the rear of the space, and can be accessed by entrances facing E. Juneau Ave.
MSOE representative JoEllen Burdue confirmed that construction is expected to wrap up in the next month or so, but an official opening date has yet to be announced. On Thursday, Pizano’s took to Facebook and Twitter to promise the location’s opening was imminent and that more details would be released soon. A company representative did not immediately respond to email questions, and Malnati could not be reached, either. 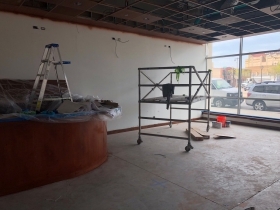 The eatery is expected to mirror its predecessors, which are known for deep dish pizza and Italian pasta. Some of the Chicago locations have late-night hours that include delivery. If the Milwaukee Pizano’s does the same, it could alleviate some of the crowds common at the neighboring Qdoba and Ian’s Pizza after bars close. The menu at its restaurants is all-Italian and all encompassing, with such items as meatball salad, chicken marsala, homemade angel hair pasta, homemade lobster ravioli and mushroom risotto. The chain now has five locations in Chicago and one in Glenview, Illinois. This would be the first location outside its home state. Chicago style deep dish is… not very good. It sounds like you don’t prefer it. Their pizza is in fact….very good.